The Marine Biological Laboratory in Woods Hole. MA will be offering their “STAMPS”: (Strategies & Techniques for Analyzing Microbial Population Structures) Course this August (8/3-8/13). Details on the course are below. To apply see this web site: here. DUE DATE IS APRIL 8. Note – funds are available to cover the costs (tuition, room and board, but not travel) of 10 people who work on “Microbiology of the Built Environment” . Topics to be covered include but are not limited to acquisition and organization of next generation sequence data; principles of quality control of sequence data and data management; methods of taxonomic assignment and clustering of targeted gene data; assembly, functional classification and characterization of shotgun metagenomic data; statistical models for estimating microbial diversity; and microbial community comparison methodology and metrics. The workshop also includes an introduction to the Linux command-line and R statistical environments. The lectures will be augmented by a computer laboratory where students will have the opportunity to use state of the art facilities to test theoretical concepts described in the lectures series. Guided by authors of resources including CatchAll, LEfSe, mothur, Oligotyping, MetaPathways, MetaPhlAn, PhyloSeq, QIIME, USEARCH, Unifrac, and VAMPS, participants in the workshop will have the opportunity to compare different analysis techniques for molecular data, analyze their own data, and discuss their data and analyses with faculty. The course is designed for established investigators, postdoctoral fellows and advanced graduate students from diverse biological fields. 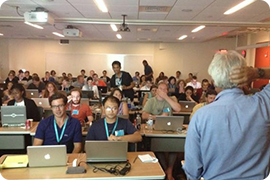 The Workshop Participants will also be given priority for acceptance into the MBL’s Workshop in Molecular Evolution that will meet the preceding week. This option will provide an opportunity to develop a stronger conceptual framework for understanding the basis of analytical tools in the STAMPS workshop. @phylogenomics Will encourage the GeoBiology students this year to keep learning and look at courses like STAMPS! More of a good thing!